It feels like a long time ago I posted anything else than my illusions. 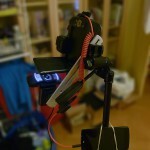 Hmh… I have many posts I should finish, that are still just drafts, stuff like instant projects makes me remember that. This is one project like that, something quick I had to finish fast, I had been thinking about it for a while but then just did something. Of course, here the motivation is to share it with people before a certain date, so that pushes me on. Enough self reflection, this is my Christmas card for 2014. As I’m still just renting a room I don’t have much space and no good-ish camera left to take pictures of my rig, but I retouched one of the only pictures I took of it with my compact camera. 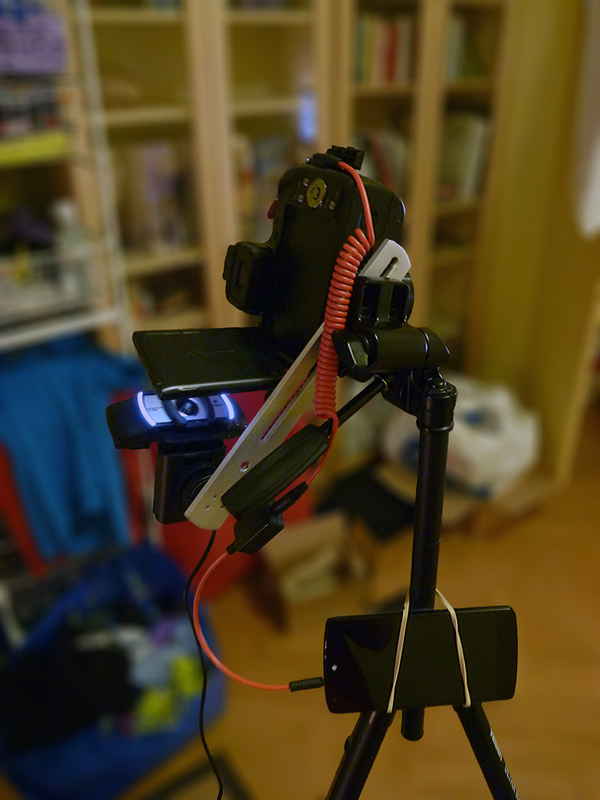 This is a Panasonic Lumix G5 hooked up via a TriggerTrap dongle to a Nexus 5. In the flash hot-shoe, not really visible, there’s a FlashQ wireless flash trigger and at the back of the rail there’s a Logitech C930e webcam. On the floor I had a flash in the FlashQ receiver which was mounted on a small flexible tripod. The webcam piped an image of the G5 screen to my desktop computer. Sadly the G5 does not have live video out so I could not use a direct feed. On my machine I had previously made a webpage that loads the webcam and displays it as a stereo pair converged at infinity (I think), this so it can be viewed in the Oculus Rift DK1/DK2. There’s no distortion correction or anything, but as the image is mostly in the center it works out anyway. When I did this shoot I updated the page so the webcam views are flipped on their side, because I photograph in portrait, and I also mirrored them for easier posing. We are much more used to mirrors than a correct view for posing, if you hadn’t noticed Skype does this to your own webcam view automatically. I also added the image I wanted to replicate as an overlay. 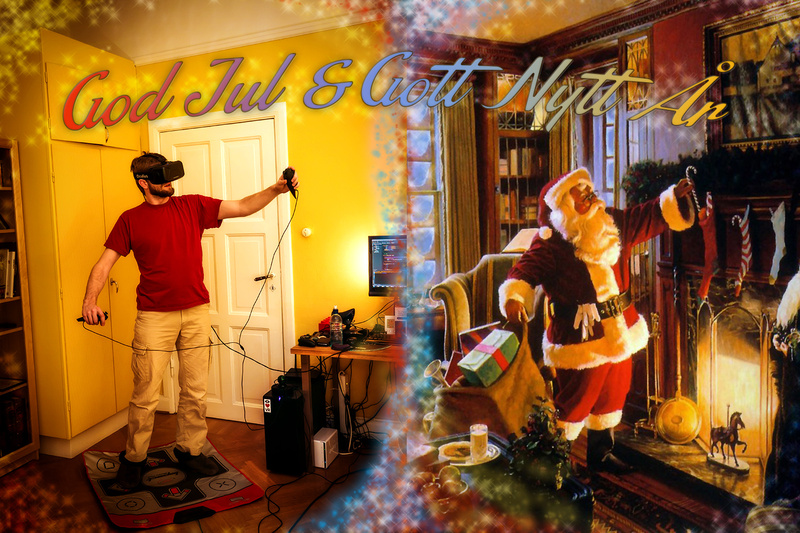 As you might have guessed, wearing the headset I saw myself superimposed with the Santa wallpaper I had downloaded. Yeah, credit to someone somewhere, I did not make the artwork I just googled, sorry. I’ve made a small video of how it looked inside the headset while I was posing, it can be played back in a headset to see exactly what I saw. It’s a bit weird to see myself in third person, quite odd trying to reach for stuff, but it worked pretty well for this project. The video has no audio as I was listening to music while shooting. I think the hardest part, as with many other of my photo projects I do, was alignment. Not only did I have to place the camera to get all of me in the picture, basically shooting corner to corner, but I also aligned the dance-mat to be under the feet of Mr. Clause and then tried to match the scale as good as I could. Then it was all about aligning myself to the ghost of Santa, the phone app was set to take one shot every ten seconds. In addition to this, I had previously aligned the webcam to the screen of the camera, which took some time to get right as I had to adjust two axes simultaneously to still get a non-distorted image. It was an interesting experiment, and it worked out better than I had expected, there are a few details I’m not that pleased with but meh… you’ll have to figure those out by yourself ;) I did not have the brains or time to set things up again, I had to disassemble the setup to get to the memory card. All in all I’m pretty happy with the result, a bit different than my usual Photoshop creations, not so much compositing but that left me with some brains left to add some framing. If I do this again I will probably have the reference image either as a black or white outline or have some way of toggling it on and off, perhaps automatically cycling. This time around I had some issues to see the reference art and myself at the same time, which can also be attributed to the still limited resolution of the Rift headset. This entry was posted in Creative, Photography, Virtual Reality and tagged Oculus Rift, Panasonic FT1, Panasonic Lumix G5, Photos, Photoshop, Video, Virtual Reality. Bookmark the permalink.